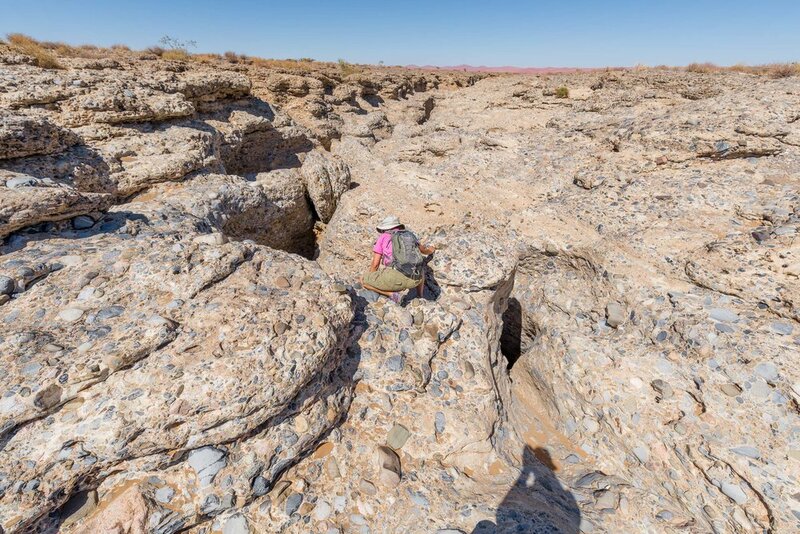 Sesriem Canyon is located less than 5 km from the Sossusvlei entrance to Namib-Naukloft National Park. It was a totally unexpected find. In fact, we'd actually driven across the dry tributary riverbed many times, and done so just a couple hundred meters from the head of the canyon. We'd had no idea it was there. None at all. The canyon is a long cleft rent into the rock that at points is less than 6 feet wide and more than 100 feet deep. In fact, the name comes from the original Afrikaans settlers who would use Oryx-hide straps ("riem") to pull water from a relatively permanent pool at the canyon's head. It took six ("ses") such straps to reach the bottom, hence, Six-Strap Canyon. Less than two feet in front of Donna, the river bed, which is a few feet deep at my feet, plummets the better part of a hundred feet into the Earth. The inconspicuous head of Sesriem Canyon. Don't believe me? The photo on the left was taken from below looking up toward where she's crouched. The photo on the right should give a little sense of scale. 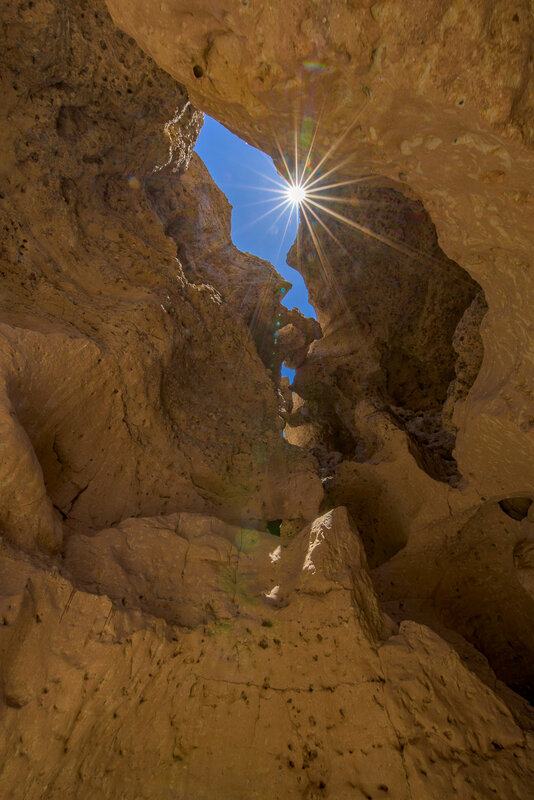 Peering up at the head of Sesriem Canyon. 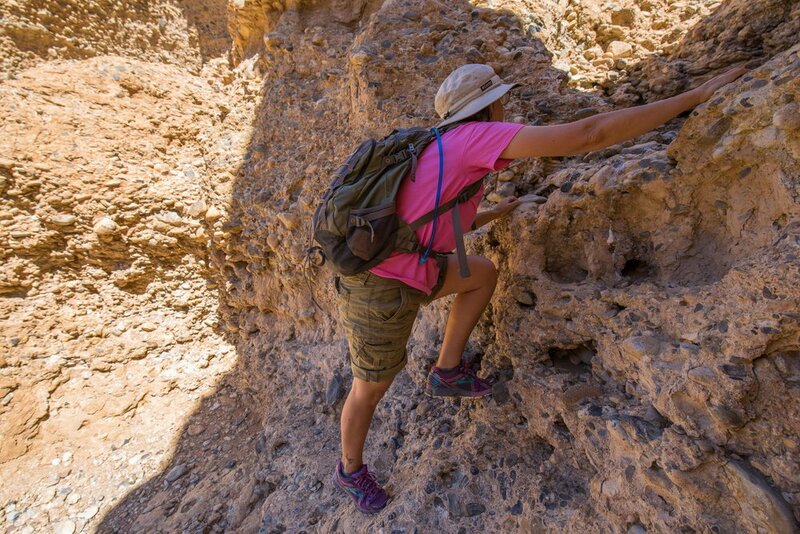 Donna standing, arms outstretched, within the depths of Sesriem Canyon. Just for the record there is a nice set of rock stairs into the canyon. Our first attempt was a little sketchier than it probably should have been, and definitely than it needed to be. Fun bit of scrambling though. We ledged out when we were still about 20 feet off the canyon floor and had to climb back up. Nice scrambling to get back out, though. The rock looks pretty sketchy, but it was all cemented firmly together. Nothing ever pulled out on us. Once we found the stairs we actually headed downstream first, to get a little bit of hiking in. In turns out the canyon's only a couple of kilometers long so it didn't take long to explore the vast majority of it. The canyon starts to widen fairly quickly from its narrow head. Could you survive here? Find water? Start a fire? Eek. We took a number of breaks, both on the way out and back. The heat was pretty impressive, even though it was only mid-morning, but there were plenty of places to find a little shade. Donna took a cue from our reptilian ancestors and did a little heat dumping. As it was still morning, the rocks here had yet to see direct sun. They were still cool from the night, maybe 70 degrees. We put them under our shirts, on our backs, arranged them down our legs. Great way to cool off quickly! Is a dog. Or two. And then it ends. A couple of kilometers downstream from the narrow head, the river bed washes out into a wide arroyo. So long geology. 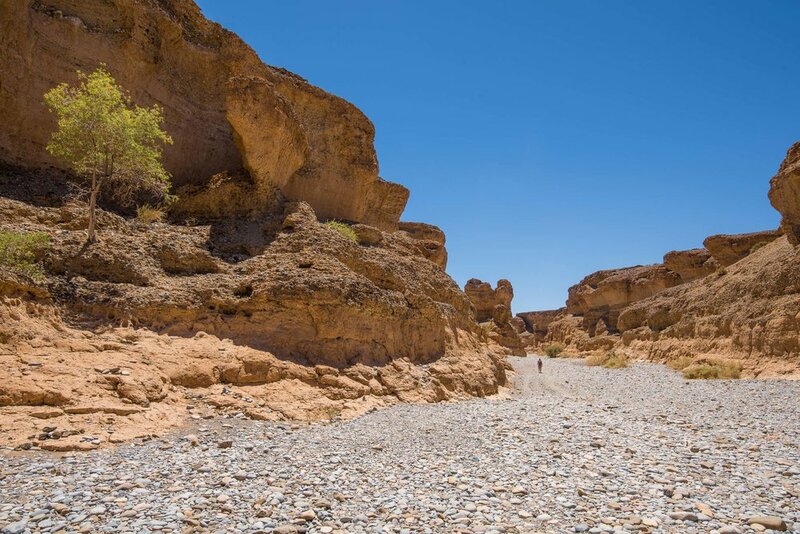 The mouth of Sesriem Canyon is only a couple of kilometers downstream from its head. Show's over folks. You can turn around. We did spot some cool birds on the way out. The given name of the Pigeon is the Rock Dove, and these were actually doing as their feral Rock Dove brethren should do, roosting in the rocks. 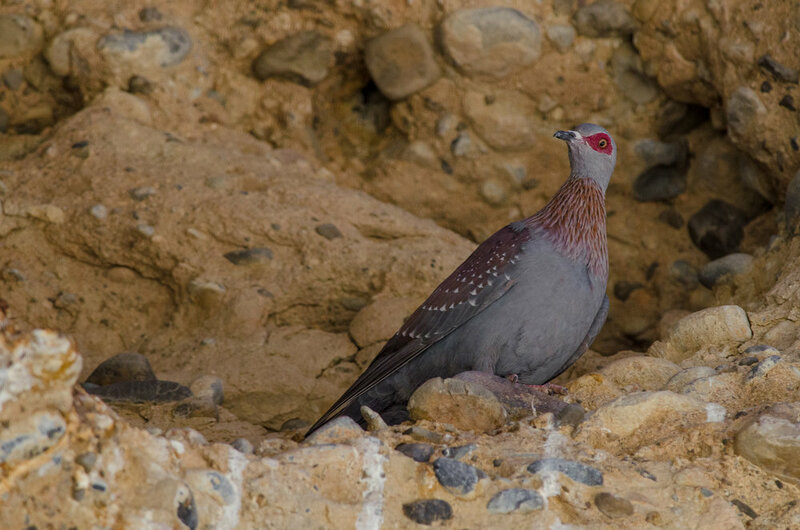 Many Speckled Pigeons roost on the walls near the head of the canyon. Their hooting calls reverberated around in the shadows. That expression translates roughly as, Whooa, it's flipping warm up here!